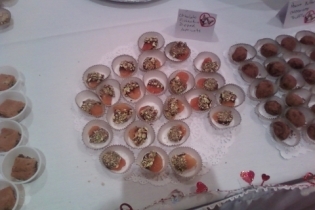 Ok, so this might be cheating just a little bit, but I went to a chocolate festival today and thought there was no way I could let it pass without some pictures and comments. Originally when my BFF brought up the idea of going, I thought it was going to be a bit like a typical “taste” event. If you don’t know what I mean, there are tons of towns that do these sort of events. They get local business to line up by the truckload and offer a small sampling of their wares. The ones I have been to sell tickets and then different food vendors charge different numbers of tickets for their wares. For example, two meatballs from an Italian place might cost 1 ticket (or $1). I thought this event was going to be along the same lines: local chocolate places offering up bite-sized versions of their wares. Since there was a “gate” price of $10 and a promise of 80 different kinds of chocolate to choose from, I thought maybe we’d get so many tickets to spend however we wanted. This was not what we were greeted with when the doors finally opened though. We were instead pointed to a pile of plates and napkins all stacked in cute spiral patterns next to several banquet length tables full of circular trays loaded with chocolate treats. Each treat had a label explaining the particular bite filling it’s circumference. To my surprise, there were no bakery or chocolate shop names anywhere on the cards. As we made our way around the table, we started plucking yummy sounding flavor combinations off of the trays and piling them on our plates. I made grabs for several types of brownies (including German chocolate, mint, turtle and double fudge) as well as some fun sounding truffles (turtle cheesecake, chocolate peanut butter and something or other raspberry). 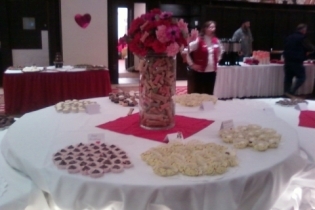 I also snagged a cake sample, some toffee, and some sort of raspberry cookie looking thing. My plate was getting pretty full and I felt a momentary stab of guilt. I mean, the event had just started and there were three more hours to go, and here I was hogging everything I could. Then I looked at my BFF’s plate and it was stacked just as high. So was everyone else’s. I felt a tad better. We decided to stake our claim to seats. We headed for the back tables where we’d be less likely to have to make small talk with strangers. Not that either of us are anti-social per say, but neither of us relish the idea of discussing someone’s grandchildren or ailments. We just wanted to snarf down some chocolate and enjoy a day out. 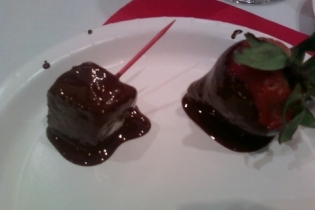 On our way to the back, we spotted a chocolate fountain and after dropping our plates at an empty table, we headed back for second plates to get some angel food cake and strawberries to dip. We also stopped at the beverage station where we got some non-alcoholic champagne (read sparkling grape juice). My BFF was appalled to see they also had both milk and chocolate milk sitting out slowly warming to room temperature. We quickly walked away before she lost her super yummy lunch. After my first bite of German chocolate brownie bite, I realized why there were no confectionary names on those little cards: they weren’t from local sweet shops at all. 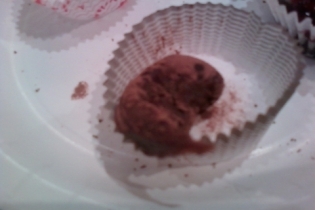 The chocolate tidbits were obviously made by volunteers, then cut into tiny pieces and placed in cute little wrappers. I was expecting to get a taste of local chocolates, and I did. I just wasn’t expecting them to come directly from the homes of those locals. Now, I’m not mocking some no doubt very sweet animal lovers, whose hearts are no doubt in the right places. I’m just saying I didn’t get what I expected (or wanted). Every item was obviously made with cheap chocolate and inexpensive ingredients. The mint brownie for example, which looked a bit like a Mint Meltaway from Fannie May, was a very bland brownie (no real cocoa flavor to speak of) with an overly artificial mint flavoring nestled between it and the thin layer of what tasted like Hershey’s fudge on top. The peanut butter truffle, which actually was a nice mix of chocolate and peanut butter (even though it had a decidedly stretchy, non-truffle texture), was doused in what I’m pretty sure was just Hershey’s Cocoa powder (or possibly an even lower rent knock-off version of the stuff) and the slightly tinny tasting powder took a lot of the joy away from the candy. The fondue was not even remotely warm, so biting in to the angel food cake was very odd. The chocolate was not the creamy milk I expected, but rather a watery semi-sweet which I think might have had some oil added to thin it out even more. There was nothing wrong with the cake or the strawberry dipped in it, but once again, I expected milk chocolate and got a slightly bitter semi-sweet. And by the way, what the hell is with people using semi-sweet in chocolate fountains? I know it’s cheaper in a lot of cases, but there is a reason for that. When there is a chocolate fountain, people want warm, creamy milk chocolate to dip their goodies in. If you can’t give it to them, don’t even bother with the fountain! I will say the ambience was great. It was very elegant looking (considering it was in a room with Kountry Krap and antlers hanging on the walls). The soft music was a nice touch. So was the “champagne”–and they did have a cash bar as well. 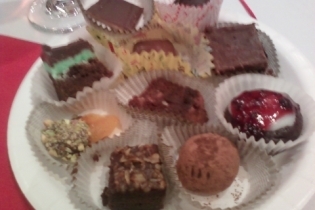 The people at my table, who did not seem to have any sort of refined chocolate pallet, really liked the food. They had piles which put mine to shame and gobbled it without any real thought. My BFF and I were quietly analyzing each piece. Even though the chocolate wasn’t exactly top shelf, it was still a fun event. And, it was for a good cause, so I have to be ok with the $10 I dropped to get in. I thought it was a great idea for a fundraiser and now that I know what I’m getting in to, I’d definitely do it again. It was nice, after all, to have a day out with my BFF (we not only had chocolate, but a nice lunch at a place I almost never get to go to and we got to do some shopping). It was a bit of a drive, but that just meant more time to talk. Heck, good company and a good cause helps negate the mediocre chocolate. Value: 7/10 (since it was all you can eat and plates were piled high, I have to give it credit for filling me up). Since Valentine’s Day is quickly approaching, I thought it might be best to feast on Godiva’s newest collection: Heart Duets. There are only four pieces in this collection, and I’ll be honest, only two really appealed to me, so they are the only two I bought. The collection has a dark chocolate/strawberry piece, a milk chocolate/black raspberry piece, a white chocolate/apple piece and a milk chocolate/banana piece. Now, I can’t bring myself to try anything banana flavored. I don’t know why. I love real bananas, but am not a fan of anything else banana flavored (except bread, but that is made with 100% real bananas). I’m also kind of burned out on apple flavored chocolates. It’s not that I don’t like the flavor combo, I usually do, but I just wasn’t feeling it this trip, so I skipped that one too. I decided to focus on the two which looked most like potential Valentine’s treats: the dark chocolate strawberry and the milk chocolate black raspberry. Since I’m a best for last kind of gal, I decided to polish off the dark chocolate piece first, even though it was definitely the most eye-catching of the collection. I really like the bright red color of this chocolate. The flavor, on the other hand, is another story. Don’t misunderstand, it didn’t taste bad. It just didn’t taste very much like strawberry either. If I hadn’t seen the dark chocolate back, I wouldn’t have realized it was a dark piece. There was none of the usual bitterness to it. It had a creamy chocolate inside, but that was about all I tasted. 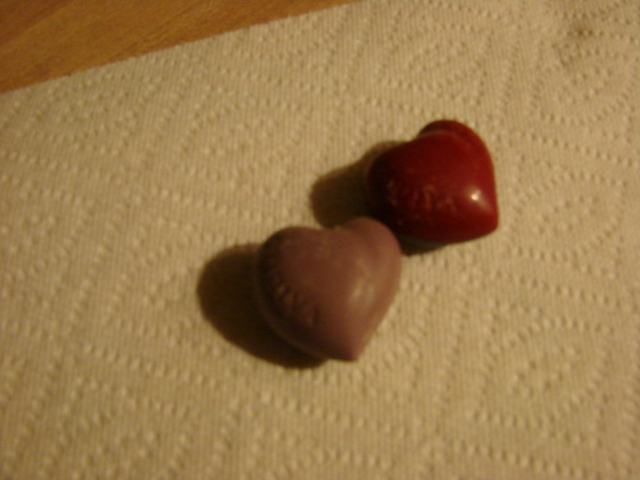 There was a tiny wisp of fruit flavor which reminded me of a toned down version of their black raspberry truffle (the one that actually has the cute red heart on it). I think the strawberry flavor gets lost in all of the chocolate. Godiva’s hearts are always kind of heavy on the chocolate. Now, I realize that sounds like a dumb thing to say since they are a chocolatier. However, what I mean is that there is so much area taken up by pure chocolate, that any flavoring often loses its punch. It gets hidden in the chocolate and to quote Iron Chef judges, the secret ingredient just isn’t “the star of the dish.” I think I described it accurately when I called it the dark chocolate/strawberry heart. Although, to be even more accurate, I might have to call it the DARK CHOCOLATE/strawberry heart. It had a good chocolate flavor, but the fruity hints were so subtle, they basically got lost. As for the milk/black raspberry piece, I feel it was a bit more successful in showcasing the fruit. But only a bit more. The tiny seeds mixed in with the chocolate ganache fooled my brain into thinking there was more raspberry than there actually was. It’s a texture trick I feel too many chocolate companies rely on. Now, in fairness to Godiva, anytime I eat something that claims to be black raspberry, I always forget that it will not have the same tart punch the good ol’ red version would have. Black raspberries themselves have a far more subdued flavor and often, my brain just thinks raspberry and when I don’t get that tart, I get let down. I tried to remind myself that this wasn’t going to be the raspberry I adore, but my stupid monkey brain forgot for a brief second. This piece actually left me with a bit of a fruity after taste, which was an improvement on its strawberry counterparts. I think since milk chocolate is also a tad blander of a flavor, it is a better vehicle for letting the raspberry come through. Too often, the only fruit combos which really shine with dark chocolate are very tart fruits, and good strawberries should be more sweet than tart. Had the strawberry been with a milk chocolate, I think the flavor would have come to life more. It would not, however, have looked as appealing. And while the dark chocolate may have given the pale lavender of the milk/black raspberry piece a bit more pizzazz, I don’t think dark chocolate and the often mealy black raspberry work well together. If I was giving a Valentine’s gift and just wanting to score points for sticking to the theme and being cute, this collection would be swell. But, if I was hoping to impress with the flavor, this would not be my pick. I’d go for one of their assorted boxes of chocolate in a pretty heart-shaped box, or even a box full of raspberry cordials, which have very pretty shiny pink wrapping paper AND a glorious mix of dark chocolate with the most amazingly tart raspberry center I’ve ever had. A cute attempt to brighten the holiday, but not a score in my book.